← Visit Free Hot Water at Booth 3832 at Solar Power International 2011! When Steve Jobs resigned as CEO of Apple, I wrote a blog post on RenewableEnergyWorld.com about lessons that the solar PV industry could learn from him. 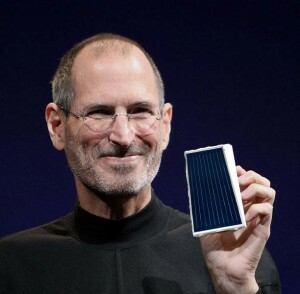 Now, as the news streams in about his death, I’d like to add my thoughts about what the solar thermal industry can learn from Apple and Steve Jobs. Steve Jobs/Solar Thermal Lesson #1: It’s okay to be #2, so long as you’re working hard to be the best at what YOU do. Even with all of Apple’s success today, the world is still dominated by PC based computers. Similarly, the solar thermal industry gets less attention from the press and policy makers. Being the #2 computer platform didn’t stop Steve Jobs from innovating and finding an extremely loyal following for Apple products. In the same way, solar thermal installers must continue to develop our own customer base that can most benefit from solar hot water and solar thermal applications. Consequently, we must aggressively engage with apartment building owners, hotels, hospitals, colleges, and all multi-residential facilities, educating them about solar hot water’s benefits. With centralized heating systems and limited roof space, solar thermal is clearly worthy of the owner’s attention, and like Jobs, we must continue to send the message that solar thermal works and that it is cost effective for these applications (and more) —even without subsidies. Steve Jobs/Solar Thermal Lesson #2: Rely less on policy and more on creating the market. While the CSI Thermal program here in California is in full swing, according to the latest research from SEIA, solar thermal growth in California is still pretty flat. I can’t think of any way that Jobs and Apple were markedly affected by a government policy, except perhaps NAFTA. But Free Trade benefits everyone. So, when it comes down to it, the Apple team and Jobs became successful without policy makers and incentives. They charged premium prices to customers, who gladly stood on a line for hours, sometimes days. In the same way, solar thermal—and PV—must strive to provide solar thermal products and services that cost effectively serve its commercial and residential customers without depending on subsidies. In fact, Free Hot Water did just that recently, reducing prices on our new OG300 systems to make solar thermal more affordable for residential customers. Do subsidies help? Of course they do, but solar thermal is and will remain cost effective today, especially for large commercial installations listed above. Steve/Solar Thermal Lesson #3: Believe in what you do and persevere. Steve Jobs has a great deal of success, but he also had a great deal of failure, being ousted from Apple in 1985. But he kept going, creating another computer company, NeXT… which also failed. And yet, Jobs didn’t stop innovating. He founded invested in Pixar and eventually returned to Apple to save it from bankruptcy. He didn’t do it for the money, but because he wanted to challenge the status quo. He didn’t believe that everyone should settle for a boring, complicated PC computer –or smart phone or slate computer. Similarly, like Apple, solar thermal technology is very different from gas, propane, and electric water heating. Those energy sources currently may be the default water heating energies in America, but that’s not the case in other countries. Europe, Israel, and China are filled with solar water heaters and very common. Why? Because they lack the gas and coal that’s so abundant and cheap in the U.S, and so free solar energy is more valuable and prized. Despite American market challenges, as an industry, we must continue to show people that there is another source of thermal heating power and that it is available throughout the world, today and for the foreseeable future–especially as fossil fuel prices rise. Those are our thoughts on lessons we can learn from Steve Jobs’ life and work. If you have more thoughts related to the solar thermal industry, pleas share them in the comments. Finally, we’d like to leave you with some inspiring quotes from Steve Jobs. At Free Hot Water, we celebrate his life and his worldwide inspiration to think differently. We hope you do too. This entry was posted in Hotel Solar Hot Water, Residential Solar Hot Water, Solar Business Resources, Solar Hot Water, Solar Hot Water for Apartment Buildings, Solar Hot Water News, solar hot water resources, Solar Tax Incentives, Solar Thermal & Solar Hot Water News, SRCC OG-300 solar systems and tagged Solar Business Resources, solar hot water for apartments, Solar Thermal incentives, steve jobs. Bookmark the permalink.